This add-on allows newsletter subscription preferences to be automatically written to your MailChimp mailing list using the MailChimp API. Based on their API 3.0 code, the only version MailChimp will support as of Jan 2017, this is the the way to go for people who take building their mailing lists seriously. From the site visitor's perspective, this mod is virtually seamless. You plug it in and anywhere (checkout and "my account" settings) that ProductCart would normally allow the visitor to elect to specify their e-mail preferences, the mod takes over and causes those choices to be sent directly to your designated mailing list at MailChimp - in addition to maintaining the correct choices within your ProductCart customer database table..
Additionally, a simple e-mail subscriber signup form is provided which you may integrate into your own web design. This script plugs into the ProductCart admin tools and provides an easy-to-use interface where one may configure the various settings. 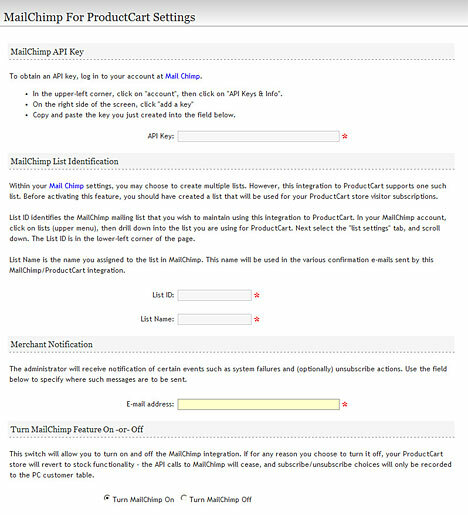 Please click the image below for a larger (scrollable) view of the MailChimp settings admin screen. To order this code, pay via Paypal or contact us.